There are many great woods to choose from when designing a piece of furniture. It depends on if you like a light, medium or dark-colored wood and where the new piece of furniture will be located. I tend to like medium and dark-colored woods because there is more contrast to the growth rings and figured grain. My first favorite wood is Peruvian Walnut. The color is a beautiful dark chocolate-brown with caramel streaks throughout the wood. It is a medium density hard wood that is easy to work with and finishes to a silky smooth sheen. The trees grow in Southern Mexico and Central to South America. I recently designed and built the custom secretary desk pictured above with Peruvian Walnut as the primary wood and California Claro Walnut as the secondary wood. Next on my list is Sapele, harvested from Africa. The color is a medium to dark brown with beautiful ribbon-like grain when quarter sawn. It is a spectacular wood to use for a chest, drawer fronts or a jewelry box. It is a medium density hard wood that is durable, challenging to work with and spectacular when finished. 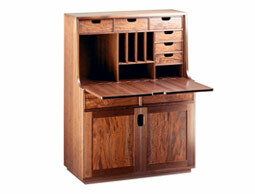 Sapele has a distinct, cedar-like scent which makes it a wonderful wood for a chest. Third on my list is Goncalo Alves, also known as Tiger Wood. The trees grow in South Mexico and Central America. The color is medium reddish-brown with unusual cloud-like streaks of black throughout the wood that resemble tiger stripes. This is a very hard and dense wood that is challenging to work with and finishes very well to a durable smooth sheen. I like using this wood for a chest of drawers, the spectacular black streaks in the wood add a lot of interest and beauty. Another great wood that I like to use for chest lids, cabinet tops or legs is Wenge. This is a very dense and hard wood from Africa that is nearly black when finished with fine tan veining interspersed throughout the grain. It is a difficult wood to work with due to the hard, coarse grain. Sometimes I hand carve a random pattern on the edges of a chest lid or cabinet top when using Wenge, this gives the finished piece a beautiful hand crafted look. My final favorite wood is California Claro Walnut. The wood is typically harvested from walnut producing orchards in Northern California after old trees have stopped producing adequate nut yields and find a second life as lumber. The wood is a rich dark chocolate to reddish-brown with dark streaks. Wood near the trunk of the tree is highly figured with beautiful curly and burl patterns. I like using this wood as a secondary wood in high-end pieces for drawer or door fronts.